Clothing that doesn’t fit correctly or is poorly designed may present tripping or entrapment hazards. Make sure that there aren’t any loops or pieces on which a foot or tooth might become caught. Ensure that all fasteners are in working order and easily opened and closed before putting the item on your pet. If you often walk your dog at night, look for reflective details in addition to flashing collar lights to help you both stay visible. Winter weather calls for warmer gear unless your dog already has a heavy fur coat. Consider your dog’s natural temperature tolerances when selecting apparel. A thick coated dog may not want a winter jacket but a short haired pup will need one. Extra layers on a warm day may overheat your dog. Make sure that your canine friend is comfortable and has a full range of motion while wearing those new duds. Restrictive clothing will hamper your pet’s ability to run and play. There is nothing fashionable about a grouchy dog. Make sure that your furry family member exhibits a style that flatters your own look while still dog with style while expressing his or her unique doggie personality. Not every dog can rock a motorcycle jacket, nor can every dog make a tiara look natural. Some dogs love to get dressed up, but some dogs don’t want any part of it. Forced fashion isn’t fashionable at all. Keep it Fashionable but Simple! Often, dog owners state that their dog does not like dressing up. It may not be that the dog doesn’t like being dressed in clothing but that the dog doesn’t enjoy certain types of clothing. Certain breeds of dogs have sensitive ears, and the idea of having something tight pulled over their head is not a pleasant thought. Dogs have very good memories, especially when it comes to unpleasant and/or painful memories. Avoid sweaters or jackets that have to go over their heads. Try to choose things that go over the dog’s back and attach on the belly. Clothing with Velcro makes an excellent choice because it’s comfortable and can be adjusted for growth or extra comfort. Avoid zippers because they can be very restricting to dogs. Dog boots or booties – They're very practical but incredibly stylish - almost by accident! Rubber boots or neoprene water-resistant booties are great for keeping your dog’s feet warm in the winter, but are impractical in the summer. Choose booties made with breathable mesh on the top and anti-slip bottoms. They won’t make the dog’s feet hot and will protect them from the hot pavement. You can also go with adorable sneakers or sandals for a little "extra" edge. Jackets – Dog jackets are functional and allow your dog to express their personality. Leather jackets never go out of style for any breed dog. If you are looking or something a little softer and lighter argyle and cotton are popular yet durable fabrics. 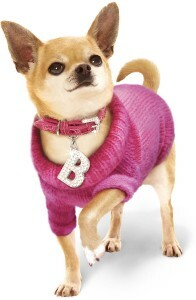 Sweaters – Your dog can be a fashionista with snuggly sweaters to keep her cozy and warm on any occasion. Sweater styles that don’t seem to go out of style are 4th of July designs (or any holiday designs, really), camouflage and tie-dye patterns. Avoid sweaters in hot weather, but if you do use a sweater, choose a cool and lightweight fabric. Collars – Regardless of the pattern or design, matching collars and leashes are always in style and work great if you want to “dress up” a dog that’s not real tolerant of dog clothing. Studded collars will give your male dog a real sense of toughness and being the alpha! Or how about a glitter and rhinestone leash? Doggy sunglasses – You can keep your dog styling and safe with sunglasses. These are excellent choices for when your dog and you are traveling in a car. Dogs tend to like looking out the window, and doggy sunglasses prevent dirt and dust from getting in their eyes. You can get some retro-looking waterproof glasses with adjustable chin and head straps. Bandanas – Bandanas are the perfect choice for the dog that isn’t all about fashion and “dressing up for the occasion”. Bandanas are inexpensive, come in many colors and designs and can actually keep your dog cool in the summer months. Cotton is an ideal choice for doggie bandanas. 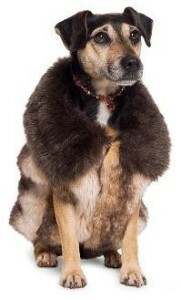 Dog fashion has evolved from the fancy boutique collars and hand-knit sweaters of decades gone by. Dog clothing should be functional and fashionable for everyday wear, but it should also fit the bill when a special event arises! 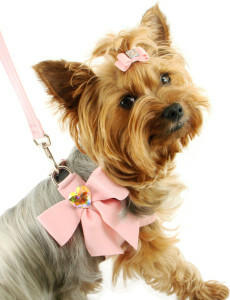 Today you can find an enormous variety of apparel for your pet ranging from the very simple to the most sophisticated. Rain coats, parkas, and boots are available to protect our furry friends from adverse weather conditions. Wedding attire, party dresses, casual wear, sports team gear, costumes and fancy footwear are all available. While you’re watching the highlights from Fashion Week, keep your canine companion in mind. Maybe you both need an updated wardrobe this spring. If you are having trouble finding what you need for your friend, the vast world of online shopping makes the possibilities endless. There are several methods you can use to measure your dog's paw and we highlighted the easiest and most accurate method below. Please keep in mind that you will need to measure the entire part of the paw that touches the floor - from the back paw pad to the edge of the toenail. You will also want to be sure your dog's nails are trimmed to ensure the most comfortable fit. It is best to measure your dog's paws while your dog is standing so the paw is completely splayed. When your dog is standing you will get a wider measurement (more accurate) than when your dog is laying or sitting. Place your dog's paw on a blank piece of paper and mark the front & back of the paw (include toenail) for length measurement. Measure the distance between the lines. Do the same on the left and right sides of the paw for width measurement. Do not trace the paw. Size does matter. Incorrectly sized dog boots will not be comfortable or perform well. We have a very simple 2 step sizing process. 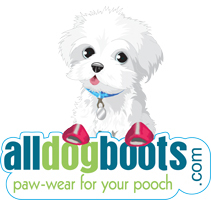 *Every product page on the website has a specific size chart corresponding to that particular dog shoe. * Most product pages also include a chart your dog can stand to help you pick the right size. Please set ACTUAL SIZE or 100% setting for your printer. The actual dimensions the paw prints should measure are listed on the images. It is necessary to measure the paper to make sure it printed accurately. If your dog’s shoe size falls in between two different sizes, choose the larger of the two to be sure the boots aren’t too tight or uncomfortable.